Comments: ESPN To Stream College Hoops On Facebook | NetNewsCheck.com. Glenn Beck will end his daily Fox News Channel program later this year. His departure was jointly announced in a statement on Wednesday by Fox and Mr. Beck’s company, Mercury Radio Arts. The statement did not specify an end date for the show, called “Glenn Beck,” which has been telecast at 5 p.m. on Fox News since early 2009. Mr. Beck’s contract with Fox ends in December. According to to a joint statement from from Fox and Beck, Beck’s production company will continue to produce content for Fox and its website, but Beck himself will “transition off” his regular show by the end of the year. Beck’s ratings have dropped recently, and thanks to Color Of Change’s “Stop Glenn Beck” campaign, 300 advertisers have refused to run commercials during his broadcasts. In addition, Beck has found it increasingly difficult to find guests willing to appear on his program, forcing him to air what amounts to hour-long rants about conspiracy theories that never seem to pan out. As Ben Smith said on Twitter “‘transitioning off’ is the new euphemism for “fired/quit,” but nobody can accuse Fox of not doing its best to make Beck’s program a success. Bill O’Reilly gives Beck a regular segment each week on The O’Reilly Factor and actually went on tour with him last year. And after Beck’s “rally” on the Washington Mall last August, Fox News Sunday featured him as an exclusive guest, even though his rally had generated far fewer attendees than he had hoped. 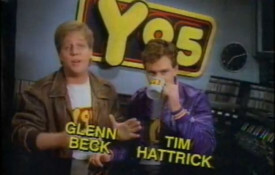 So while I imagine Beck’s fans will think Fox conspired to take him off the air, the truth is that Fox did its best to make his program a success, even as he accused President Obama of hating white people and said that the only way to stop him would be to drive a stake through his heart. It wasn’t just Fox—don’t forget that CPAC tapped Beck to be their keynote speaker in 2010. So even if conservatives try to rinse their hands clean of Glenn Beck taint, just one year ago, the most important conservative gathering in the country gave him the most prominent spot in the their program.